This Spring, Dice Hate Me Games will be launching a Kickstarter featuring six 54-card games as part of the Rabbit line of titles. Of these six games, four were chosen as winners of the Dice Hate Me 54-Card Challenge that was put forth in November. Today on Dice Hate Me, we’re taking a closer look at the design inspirations behind the games in the first three-pack of “Dinner, Drinks & Dessert”: Matthew O’Malley’s Diner (the 54-Card Challenge Grand Prize winner), Ben Rosset’s Brew Crafters Travel Card Game, and Bryan Fischer’s Pie Factory. Next week, look for a feature on the second tier of games in the Rabbit line! As a quick summary, in your own words, what is your game all about? 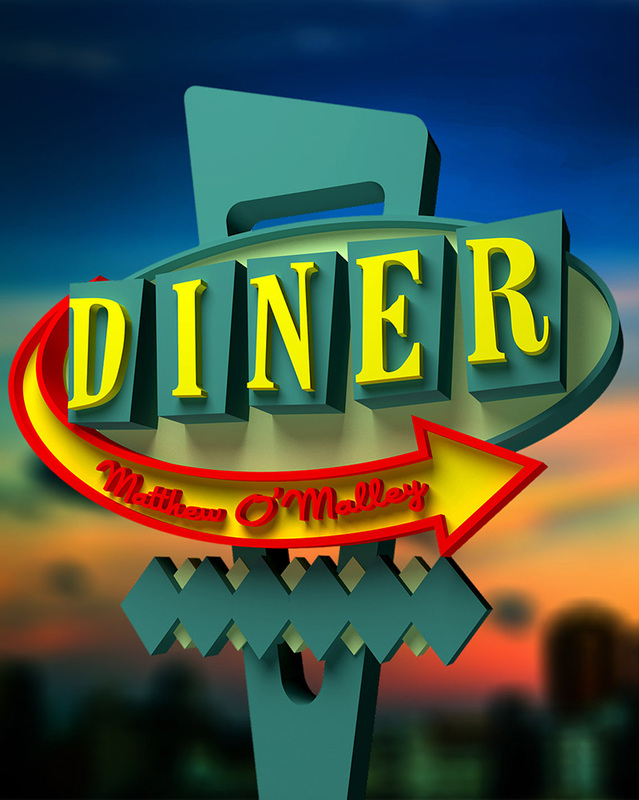 Matthew: Diner is a fast-paced game about waiters in a friendly competition to make the most money in tips. Take orders for the tables in your section, gather the plates to fill those orders, and serve your tables, and do it as quickly as possible while showing up the other players. What inspired you to come up with this design? I started working on 54-card games specifically for this Challenge. 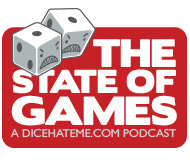 I wanted to start with a theme that would fit in with the Dice Hate Me Games line, and I had two ideas that I thought might be successful (after listening to the State of Games over the past year): Cards of Cthulhu, and Diner. Cards of Cthulhu didn’t meet the Challenge requirements for a family-friendly theme, and it also didn’t feel like it would fit well with other games by Dice Hate Me. That left me with Diner, which I thought would fit both thematically and aesthetically. The almost real-time nature of the game was inspired by Josh Tempkin, Cardboard Edison’s game Tessen, and a real-time multi-player solitaire game my wife’s family plays called Pounce. During early playtesting, I had table cards that would “age,” reducing the value of tips over time. While it worked, it didn’t really get across the feeling of working in a Diner. Josh suggested the action tokens, which does a much better job of giving the game that rushed feeling, of trying to get things done quickly to get good tips. Both Cards of Cthulhu and Diner had double-sided cards from the very beginning. I think the first time I saw that used was in Bohnanza: when you create sets of beans, you set aside the scored cards as coins using the card backs. That was also the original scoring mechanism in Diner – after you served an “aged” table, you would set aside a number of cards equal to the current tip value to keep your score–now you just remove the scored table. One advantage of the double-sided cards in Diner (and the removal of scored tables) is to add some sense of unpredictability to the game; you can never be sure if all six of those steak plates are going to come out, so counting cards won’t assure you a win. Designing within the constraint of just 54 cards is not easy. What were some of your biggest hurdles in making this design work successfully? One problem I ran across when designing Diner was figuring out how to make the game last an appropriate length of time with only 54 cards. Setting aside a number of cards equal to the tip value meant that you had to stop the game after a single time through the deck–there just weren’t enough cards to keep going. While that was fine in a two-player game, it was far too short for more players. Fixing the tip value for a table meant that players could set aside a single card to score a table, which allowed the game to cycle through the deck more than once. I also had a lot of difficulty figuring out how many different types of plates to use, and how many of each plate to use on each side of the cards. Originally there were seven different types of plates, three rare (with six cards each), three common (with ten cards each), and six dessert plates which could be added to a tip. Six or seven types of plates turned out to be too many, and five was exactly right. Too few types of plates made the game far too easy; too many types of plates made it too hard. The correct distribution of plates (a different quantity of each type with different tip values for each) also made the decisions far more interesting. For every plate on one side of a card, there are exactly three of those plates on the table side of other cards. This worked out well, since there are two to four plates on each table, and there are the same number of two-plate and four-plate tables. In addition, there are approximately the same number of different tables requiring each different plate (proportionate to the quantity of each plate type in the deck). There is a good bell curve distribution of tip values not only over the whole deck, but also for each different number of plates at a table. Each table type (two-top, three-top, and four-top) has a similar distribution of tips. It took a lot of time to balance the number of plate types on tables, the number of plate types on table types, and the values of tips. If a plate is on one side of a card, it is never on the reverse side of the same card. The tips are all based on an exact value for each plate, rounded up to the nearest dollar. The most common plate is worth $.50 in tip, and the least common plate is worth $2.50 in tip. This gives players the ability to choose certain tables or plates based on tip value, while being aware that the more it’s worth, the less likely it is to show up. What do you think are the biggest strengths of your design? As both a designer and a gamer, what makes this game worthy of being added to a collection? Diner is a fast-paced portable game of skill with plenty of quick decisions packed into a simple design. Add it to your collection if you want a good multi-player game with some real-time feel but with checks and balances so that each player gets close to the same number of turns. And who doesn’t need a game with bacon and pancakes? Ben: In Brew Crafters Travel Card Game, you’ve opened your own brewery and are competing with other brewers in town to be named the Brew Crafter of your city. You’ll build your brewery by installing equipment and hiring worker, and then get to work brewing your beer! The player that earns the most reputation as the city’s best brewer will win! Brew Crafters Travel Card Game is based on the upcoming Dice Hate Me Games release Brew Crafters, wich was funded on kickstarted last November and will be released in summer 2014. The Dice Hate Me 54-card challenge inspired me, of course! I had been thinking about trying to make a version of Brew Crafters that could actually be played at a bar (or be taken anywhere else while traveling), and the 54-card idea was the perfect solution for that. As soon as the contest was announced, I got the basic idea for the game and set to work. My biggest design challenge was giving the players enough different paths to victory so that the game would have high replayability. The way I accomplished that was by giving each of the 54 cards two uses. Each card can either be used as a particular ingredient or for a particular brewery effect, but not both. This, in essence, allowed me to create 108 different cards out of only 54. I believe it does a good job of distilling the Brew Crafters experience down to a very accessible, easy-to-learn 30-minute game. Fans of the full Brew Crafters (which plays in 1-3 hours depending on the number of players), will appreciate the depth that the card game version offers. As one of my playtesters said, “when I don’t have the time to play the full Brew Crafters, I can play the card game in 30 minutes and it scratches my Brew Crafters itch”. 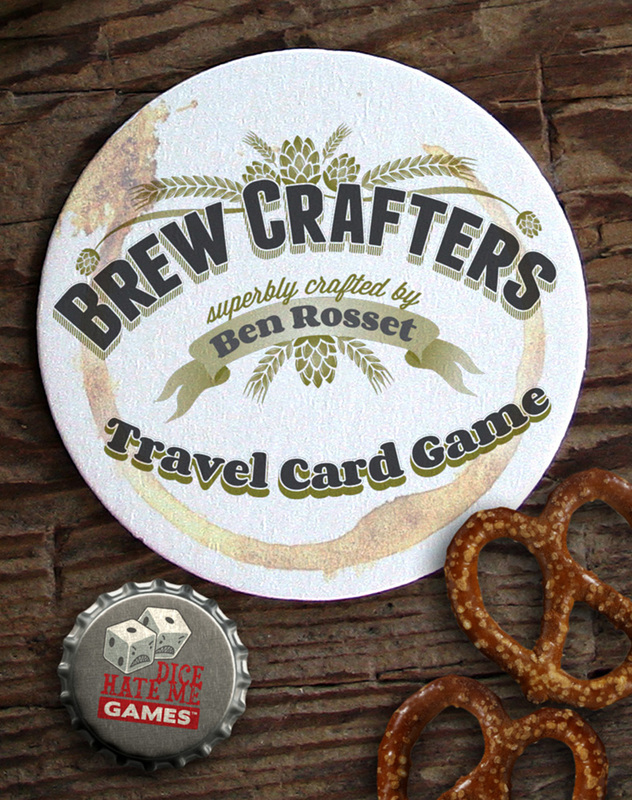 The Brew Crafters Travel Card Game will appeal to heavy gamers and casual gamers alike. Bryan: Pie Factory is all about making pies! Players are workers in a Pie Factory competing for the big promotion, so they’ll need to be smart and diligent while boxing pies and gaining the favor of factory higher-ups. At the core of the game is the Assembly Line that players draft cards from while also manipulating the player order through use of a unique time track mechanic. Players stack ingredients on top of crusts to make their favorite pies and ultimately box them to earn points. Pie-haters aren’t going to be happy about this, but I’m not a big cake fan. I never have been. In fact, I don’t live many desserts in general, pie being the main exception. The idea of Pie Factory was born out of my love for not only devouring pies, but also making them. I wanted to create a game where people could interact with cards in a new way, seeing them as ingredients in their favorite pies. The game itself needed to be like a pie … fun, sweet, complex, and maybe a little tart. That’s why Pie Factory is light hearted, but with the kind of player interaction that delivers scowls. It’s quick enough for a short game, but complex enough to reward the strategy gamer. I knew from the very beginning that I wanted to make Pie Factory super tight without much wiggle room. I wanted the choices to be meaningful and hard to make. I wanted the options to be freeing, but have consequences. The 54 card constraint gave me a threshold to work within and ended up being absolutely perfect for what I wanted to accomplish. The hardest part came in making sure I was utilizing every card to the best of my ability, making sure they had multiple uses, but in a way that felt natural and obvious. Once I figured that out, I was super happy with how tight the game was. You know that moment when a player doesn’t want to have to choose? The decision is just too hard and regardless of what they do, they’ll have to grit their teeth and just make a decision? Pie Factory is full of those. That’s what I think is its greatest strength, the decisions can be difficult. The combination of drafting, player order manipulation, hand management, and pie management (managing your workspace) makes for a game that is deceptively complex. There will be a lot of people who add this game to their collection simply because they love pie. This game is absolutely for you. For those of you who think pie is alright, but not your favorite (or you hate it, which I can’t imagine), it’s the mix of mechanics, quick play, just the right amount of depth, and replay value that will find it a nice spot in your collection. If you’re looking for a great game to play twice over a lunch hour or in between big games, but you don’t want to sacrifice play time for play value, Pie Factory is for you. 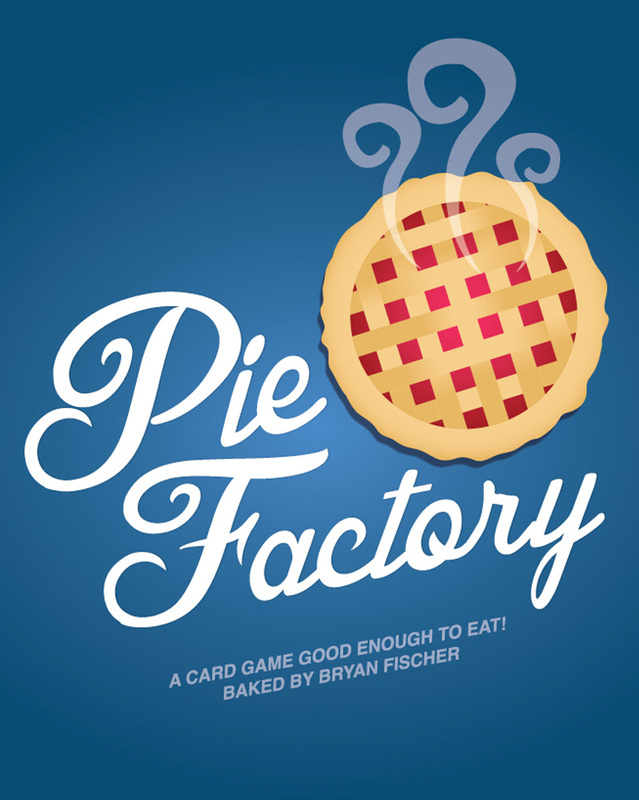 I’ve played Pie Factory with Bryan and some other folks as he was working it out, and I have to say it’s super fun. It’s about 30-45 minutes, and while we usually have played with 4 people and had a good time, Bryan and I did a 2-player game that really made use of the strategic elements. Maybe it’s because I’d played a few times before, but that was when I really built strategy into how I played. I crushed him the first time, but he edged me out in the second game (we got through two at lunch that day). I tell him all the time I can’t wait to be able to pick it up. I’m definitely excited for this pack! Pie Factory is the BEST! I’ve played it and it’s very easy and total fun. The mechanics for time tracking, can you discuss it elaborately?